Living in homogenous culture such as the Danish one has it pros and cons. Whether you love dyed hair or not, it's so refreshing to come across strong personalities like this lady here - I mean, check out those heels! Orange shabby chic. On trend with this seasons print? Check. 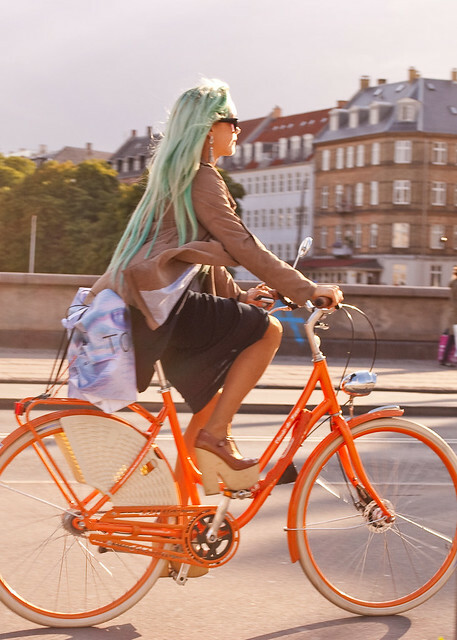 Kristina, do you know the brand of the beautiful orange bicycle? Sadly no, but these orange bikes seem to be popping up everywhere at the moment! If I ever find out the brand or brands that are hosting orange bicycles I'll be sure to let you know! @Garry, its a Raleigh Classic. Probably a 7 speed. Raleigh makes many local models so its possible this is only available in certain markets. They also have a stunning red one like this in Denmark.